“Stop TTIP” calls on European Parliament to reject ISDS in upcoming resolution. The European Citizens’ Initiative “Stop TTIP” has reached a new record number of signatures a few days ahead of a critical vote on TTIP in the European Parliament. With 2 million signatories, this is the largest European Citizens’ Initiative (ECI) since the introduction of the instrument in 2012. In order for an ECI to be successful, half this number would suffice. Moreover, Stop TTIP has collected the required minimum number of signatures in 14 EU Member States, double the amount needed to receive an official response from the European Commission and a hearing in the European Parliament. Stop TTIP is carried out by an alliance of more than 470 civil society organisations – consumer watchdogs, environmental groups and trade unions – from across Europe. Signature collection will continue until 6 October to increase political pressure further. The largest ECIs so far have been “Water is a Human Right” (2013) and “One of Us” (2013) with 1.8 million signatures each. The European Commission had rejected Stop TTIP as an official ECI in autumn last year. The alliance is currently challenging this decision in the European Court of Justice and is meanwhile carrying out the ECI signature collection on a self-organised basis. 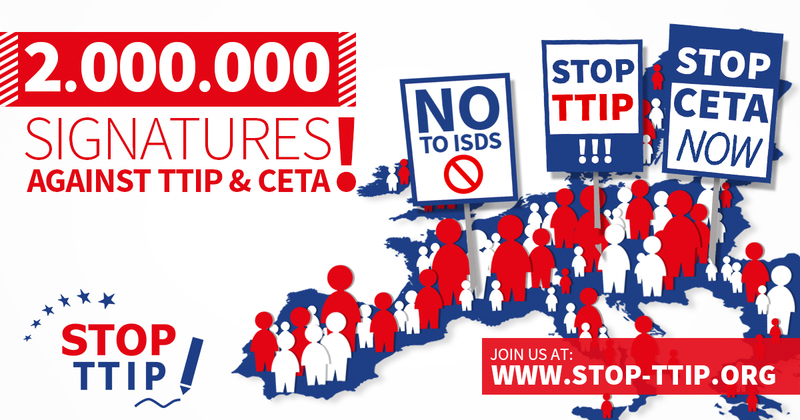 Follow the European campaign on stop-ttip.org or get involved in Sweden on stoppattip.se. If you haven’t done it yet, we encourage you to sign the petition.